Gareth Bradshaw in action for Galway during the 2016 All-Ireland championship. John Fallon reports from Pearse Stadium. GALWAY’S PROMOTION DRIVE moved up a gear with a deserved win over neighbours Clare in the first league clash between them in 22 years. Clare were always chasing the game as they fell to their first defeat of this year’s Allianz Football League Division 2 campaign. Galway led by 2-8 to 0-5 at half-time having played with the strong wind. Clare hadn’t conceded a goal in the league prior to this first meeting and have been in more difficulty had goalkeeper Joe Hayes not saved superbly from Paul Conroy and Shane Walsh. But he could do little to deprive Eamon Brannigan after six minutes, while Walsh also found the net five minutes from the interval. Clare’s short-passing game yielded some good scores with Jamie Malone getting them off the mark after 12 minutes with the first of two points from the Corofin clubman. Liam Markham and Ciaran Russell also went forward for scores, with Eoin Cleary pointing a free. But Galway kept pulling away with Barry McHugh kicking 0-4, three of them frees before the break. Johnny Heaney and McHugh extended Galway’s lead after the restart before Eoin Cleary pointed a free for Clare and then Keelan Sexton gave them hope with a 45th minute goal. Walsh responded for Galway but the Bannermen cut the gap to two goals 15 minutes from time. But any hopes of a big comeback were buried after 58 minutes when Gareth Bradshaw side-footed the ball to the net after Heaney had an effort saved by Hayes. Scorers for Galway: G Bradshaw 1-2, B McHugh 0-5 (0-4f), S Walsh 1-1, E Brannigan 1-0, M Daly 0-1, P Conroy 0-1, J Heaney 0-1, M Lundy 0-1, G O’Donnell 0-1. Scorers for Clare: E Cleary 0-4 (0-3f), K Sexton 1-0, J Malone 0-3, D Tubridy 0-2 (0-1f), L Markham 0-1, C Russell 0-1. 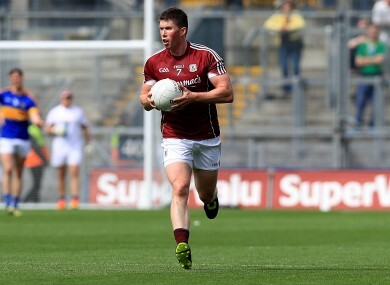 Email “Gareth Bradshaw edges Galway closer to promotion following impressive win over Clare”. Feedback on “Gareth Bradshaw edges Galway closer to promotion following impressive win over Clare”.